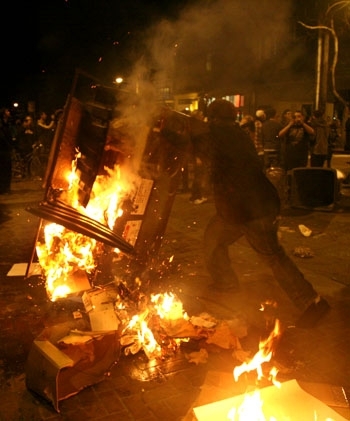 In the early hours of Feb. 26, a riot broke out on the streets south of the UC Berkeley campus. Chaos ensued as the mob danced, chanted and resorted to vandalism. A crowd of more than 200 people swarmed the streets of Southside early Friday morning in a riot involving seven law enforcement agencies, runaway dumpsters, flaming trash cans, shattered windows and violent clashes between rioters and police. What began as a dance party on Upper Sproul Plaza led to an occupation of Durant Hall at around 11:15 p.m. Thursday to raise support for the March 4 statewide protest in support of public education. According to a statement distributed by the occupiers, the building was selected because of its symbolic nature. Durant Hall formerly housed the campus East Asian Library and the campus Department of East Asian Languages and Cultures. It is now being renovated to become office space for the College of Letters and Science, which spurred activists to "reclaim" the space for students. UCPD Captain Margo Bennett said the occupiers "cut a lock to get into the construction area and then cut a lock to get into the building" before vandalizing the area. "There were windows broken, there was spray painting and graffiti on the interior, there was construction equipment that was tossed around," she said. The occupation evolved into a riot as it moved onto streets south of campus, where a protester broke several windows of the Subway at Bancroft Way and Telegraph Avenue at about 1:41 a.m.
Bennett said the occupiers were able to leave Durant Hall without police confrontation because UCPD did not have adequate staffing and the Berkeley Police Department had not responded to the scene per UCPD request before the occupiers left. She added that UCPD believes many of the occupiers were not UC Berkeley students. "Because of their manner of dress and their behavior, they did not resemble the students that we have become accustomed to dealing with over the past six months," she said. After moving off campus, the group grew and settled at Durant and Telegraph avenues. Officers from UCPD, Oakland, BART and Albany police departments, as well as the California Highway Patrol and the Alameda County Sherriff's Office, responded to the scene. All but four Berkeley Police Department officers on duty that night were dispatched to address the incident, according to Berkeley police Dispatcher Rayna Johnson. "It's a little hectic," Johnson said. Berkeley and UCPD officers stood shoulder-to-shoulder in a line on Telegraph Ave. facing the dancing crowd, which had formed around a stereo system blaring music from a shopping cart. The tone of the gathering changed at about 1:55 a.m. when a dumpster was pushed into the center of the intersection and set on fire by members of the crowd. The Berkeley Fire Department responded as people danced on top of the dumpster and shouted, "Whose street? Our street!" Employees of the Blakes on Telegraph bar and restaurant brought out buckets of water and fire extinguishers to douse the flames. Officers physically pushed the crowd back so that Berkeley fire personnel could extinguish the flames. Sporadic fights broke out within the crowd, causing police to advance their line on the growing mob and use batons to push it back. Two officers suffered minor injuries but did not require medical attention, according to a Berkeley Police Department press release. Members of the crowd hurled glass bottles, plastic buckets, pizza and other objects at the police line. The crowd's size and intensity fluctuated as the police and protesters clashed and multiple members of the crowd were detained by police. Marika Goodrich, 28, a UC Berkeley senior, was arrested at the intersection of Durant and Telegraph avenues and booked for assault on a police officer, inciting a riot and resisting arrest, according to Berkeley police Officer Andrew Frankel. Zachary Miller, 26, a UC Berkeley alumnus and an organizer for the "Rolling University," was also arrested at the intersection and was booked for inciting a riot, resisting arrest and obstructing a police officer. Goodrich is being held on $32,500 bail and Miller is being held on $22,500 bail. Both are being held at the Berkeley City Jail and are scheduled to be arraigned March 1, according to Alameda County records. No arrests were made on campus, according to Bennett. At about 2:43 a.m., the mob accompanied the shopping cart as it traveled east on Durant. As the crowd moved, a white Dodge Charger turned onto the street and people ran alongside the car as it advanced, a practice commonly referred to as "ghost riding the whip." Around 2:55 a.m., the crowd settled on College Ave. outside the Unit 1 residence halls, where some members propelled a dumpster down Durant Ave. toward police. About 15 minutes later, after the crowd launched a second dumpster down Durant Avenue, a line of police vehicles charged through the streets, scattering the crowd in all directions. Police ended the riot at approximately 3:15 a.m. When the crowd had left Durant Hall earlier in the night, UCPD Chief Mitch Celaya said the main concern for police was to assess the damage thus far and monitor the crowd as it proceeded down Telegraph Avenue. "We're going to hopefully secure the exterior," he said. "We're going to take a look to see what, if any, kind of damage has been caused. We're concerned about the group as they march around, that they don't commit any acts of vandalism, not just to our property but to the city." Although the occupation had been planned, the decision to move off campus could not be attributed to any one person, according to Callie Maidhof, a representative for the occupiers. "If you get all these people here, what they decide to do is what matters," Maidhof said. "It's not whoever may or may not have planned it, that's irrelevant at a certain point." Chancellor Robert Birgeneau, Executive Vice Chancellor and Provost George Breslauer and Vice Chancellor for Student Affairs Harry Le Grande, condemned the occupation and subsequent riot in a statement sent Friday to the campus community where they said they believe the majority of the occupiers were not UC Berkeley students. "Initial investigation indicates that about 100 people came onto campus with clear intent to break into at Durant Hall," they said in the statement. "Sadly, such action does incredible damage to our advocacy efforts with Sacramento and with the California public to preserve public higher education." Shaunt Attarian, Chris Carrassi, Tomer Ovadia, Sarah Springfield, Zach E.J. Williams and Mihir Zaveri of The Daily Californian contributed to this report.